Home Guide Jurassic World Alive: Featured Dinosaurs Week 27 – STUNNING CREATURES! Explorers! Last week was probably the most exciting week we had in a while in Jurassic World Alive; and while we were expecting things to be quite dull after this, Ludia comes through with something quite exciting again (but not AS exciting)! 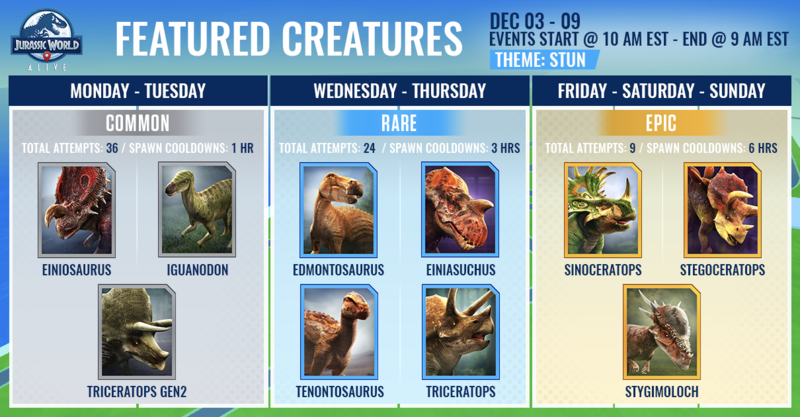 Ludia just announced another week of Featured Dinos: Stunning Creatures! Stunning Creatures were once a fan favourite, but with the balance on them in 1.5, people seem to have been on the fence about using them. Well, this week might prove you otherwise! Plus, we have some extremely valuable DNA coming our way! For the Commons, we strongly recommend to focus on either Iguanodon or Triceratops G2. The latter currently has a brand new Legendary Hybrid: Dracoceratops; and while it’s not the best Legendary in the game, it’s certainly a viable option regardless. It’s the second Legendary Dinosaur available through the fusion of two Common Dinosaurs, so it’s fairly easily accessible, but remains a good option. Iguanodon also is a decent option, if our recent datamine proves to be true, we should expect a Hybrid for that creature eventually. Therefore, stocking up on DNA could be a good idea. Otherwise, Einiosaurus certainly has a strong and decent Hybrid, Eniasuchus, and Dr. Reeb would have our head if we didn’t mention it. Our suggestion remains to focus primarily on Iguanodon (for potential future investment) and Triceratops G2. For the Rares we have 4 Dinos to choose from… Only two, in our humble opinion, are worth it. The first one you should be focusing on is Tenontosaurus. With 1.5, it was added a Unique Hybrid: Tenontorex, which currently is one of the strongest Dinosaurs in the game! Otherwise, if you already have a ton load of DNA for Tenontosaurus, which we doubt, we recommend focusing on Triceratops as it has still one of the strongest Hybrids: Stegoceratops! Tenontosaurus should remain, in our opinion, your focus. For the Epics, we are torn between two Dinosaurs: Sinoceratops and Stygimoloch. Sinoceratops may have been part of last week’s roster, but it remains an incredibly valuable resource! Do not underestimate the value of stocking up on Sinoceratops DNA as it has two very powerful Legendary Hybrids (which both, in turn, have a Unique Hybrid)! As for Stygimoloch, some of you may be tired of this fella as it was somewhat annoying to systematically get DNA for it through Incubators before 1.5. It, however, has a decent Legendary Hybrid, Paramoloch, which, in turn, has a very strong Unique Hybrid, Tuoramoloch! Furthermore, Stygimoloch remains an Arena exclusive, which makes its DNA even more scarce (especially since 1.5). Will be updated once the information is announced! This week will, luckily, not as difficult as last week in terms of decision making. It will, however, be important not to nap when the Rares and Epics will take over the map! We have some very valuable DNA coming our way!